The hollow-stem Joe Pye weed (Eutrochium fistulosum), a perennial member of the sunflower family (Asteraceae) native to the eastern and south central United States, has been named the 2017 North Carolina Wildflower of the Year. This annual wildflower program started in 1982, and since then a showy, native perennial has been chosen and seeds of that wildflower have been distributed to interested gardeners. The North Carolina Botanical Garden and the Garden Club of North Carolina coordinate the program. 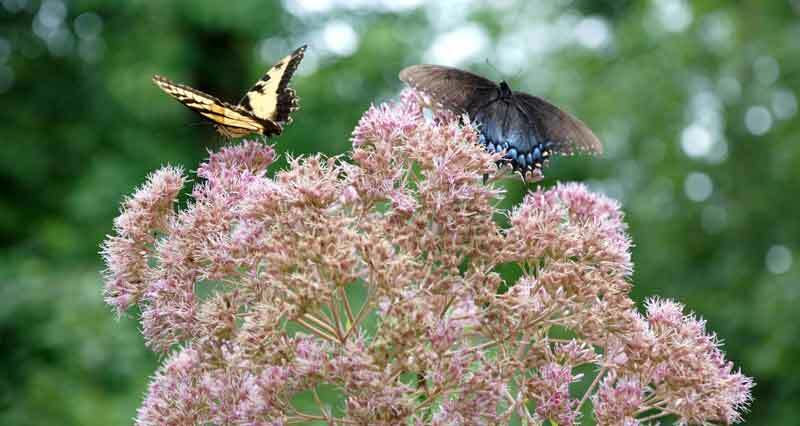 From mid-summer through early fall, hollow-stem Joe Pye weed comes into full glory with dramatic clouds of large domed flower heads covered with tiny nectar-rich, mauve-pink flowers that attract multitudes of butterflies, bees, wasps and other nectar-feeding insects. In the wild, hollow-stem Joe Pye weed can be found in moist woods, bogs, meadows, marshes and roadside ditches, and it can grow up to eight feet tall. In average to wet soil and full to filtered sunlight, it can serve as an impressive and pollinator-friendly member of a home garden landscape. Its hollow stems distinguish it from other Joe Pye weed species. Legend has it that “Joe Pye” refers to the Christian name taken on by Mohegan sachem and healer Shauquethqueat, who purportedly used infusions of the plant to treat typhus in 18th century Massachusetts. For a Wildflower of the Year brochure and packet of hollow-stem Joe Pye weed seeds, send a stamped, self-addressed, business envelope with attention to NCWFOY 2017 to North Carolina Botanical Garden, UNC–Chapel Hill, CB 3375, Chapel Hill, NC 27599-3375. To view a list of the past North Carolina Wildflowers of the Year, visit ncbg.unc.edu/north-carolina-wildflower-of-the-year.